With spring right around the corner, it’s time you start thinking about your vehicle’s safety on the road. Since melting snow and ice are beginning to slick the streets, it’s worth considering adding additional vehicle protection as this weather slowly warms. To get started today, here are a few tips you can use for adding necessary protection to your car, truck, or van. A super easy way to add protection to your vehicle this spring is to invest in an extended warranty from an extended vehicle protection provider. However, you should always check first to see whether your current warranty plan has expired or not. Generally speaking, you should always have a warranty on your vehicle to give a helping hand with damages. But before buying into any warranty plans, it’s best to go over what prices providers are charging and look to get the best bang for your buck. No matter the season, you should always be working on making necessary vehicle repairs. 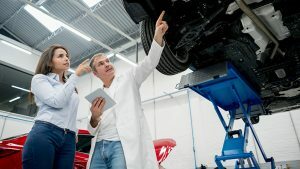 After all, the longer you take to bring your car to a local mechanic, the more extensive the damages will become and ultimately, the cost to fix it will increase. Keeping this in mind, you should head down to your local mechanic today for your annual inspection! If you’re worried about fellow drivers rear-ending you on the road, you should install a bumper protector on your vehicle. These affordable rubber mats can be placed on either end of your car, truck, or van, and can help prevent any damage during a fender bender. Plus, bumper protectors don’t usually cost more than $20-30 and can be installed by yourself! A good rule of thumb to follow this spring is to always keep your eyes on the road! There are a variety of distractions in your vehicle that can influence you to cause an accident. However, by just keeping your hands on the wheel and eyes on the road, you can lower accident statistics this spring. There are many ways you can add necessary additional protection to your vehicle this spring, from buying a warranty from an extended vehicle protection provider to installing a bumper protector. Hopefully, this short guide can offer you plenty of help this spring in staying safe on the road and minimizing vehicle damage which is always on the rise with the changing of seasons.